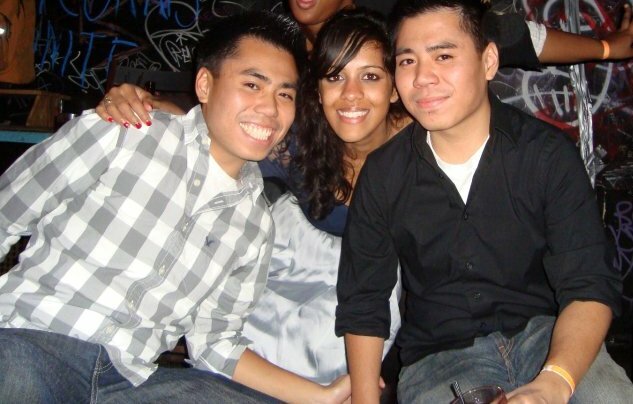 Two of my best friends are turning 25 this Sunday. Jeff and Jeremy (hi friends!) are twin brothers who have put up with me for over a decade. Not only have they put up with me, they still hang out with me! Remember when I told you that I stalked Glen Hansard? Well, these two were with me. Actually, they were half a block away and hiding from me, but both of them still wanted to be friends with me after I harassed the poor man. Also, for my birthday, they got me a New York Giants jersey (#10, Eli Manning, may the Heavens bless his adorable soul), which I have been wanting and creepily trying on at various sporting goods stores for years. They’re the best. Anyway, I love these guys, and I bake for those I love, so get ready for some cookies, homeboys! I scammed both guys into giving me a “top 3” list of their all-time favorite cookies. I think I told them I was doing research for a future post, and since they both know me as a massive dork, they believed this lie. I am a good friend. Jeff mentioned loving rainbow cookies, which are also, as I’ve mentioned, in my top two, so rainbow cookies I shall bake. Look for that post in the next couple of days. He also mentioned salted cookies and the classic chocolate chip variety. Jeremy picked chocolate chip as well and told me he loved Pepperidge Farm cookies. 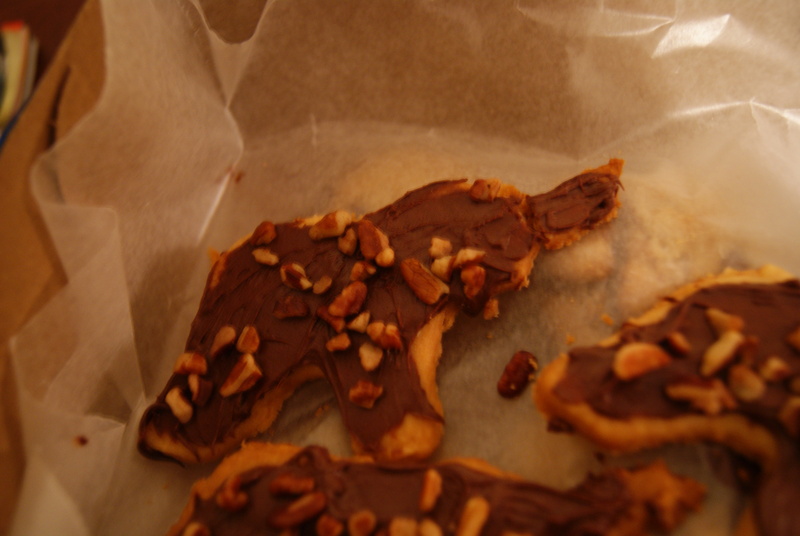 I remembered him specifically requesting that I try to make their Geneva cookies when I first started the blog. Let’s start with the Geneva cookies, since those will prove to be the more challenging of the two (oh, but wait until you hear my rainbow cookie story people). I wanted to get the cookie as close to the original recipe as possible without having to break laws or jaws. Judging by the ingredients, this looks like a shortbread cookie made with cornstarch. Since I don’t have thiamin or soy lecithin at my disposal (what the…), I decided to go with a simpler, more classic recipe. Allrecipes to the rescue! Have your oven preheated to 375°F. Also, have your patience level preheated to like nine thousand. Yes, kids, it’s story time. So I whipped the butter with an electric mixer until it was nice and fluffy, like you’re supposed to. This was easy, as I do it all the time. Adding in the sugar was also pretty simple. Next up was the cornstarch. Still fine. Then the flour. THEN THE ANNOYANCE. It takes forever to get this to look anything like a dough. At first it looks like cereal. Then it looks like cereal. Then, ten minutes later, it looks like cereal. This dough is very crumb-y and delicate, so if after decades of mixing, you find yourself with results similar to mine, I recommend getting into this with clean hands and working it into an actual dough. Also, as I said, this is pretty fragile, so I suggest wrapping it up in wax paper and throwing it in the refrigerator for an hour or two to firm it up a bit. Any longer and the dough will harden, and you will have to wait another three or four hours to get it just right. 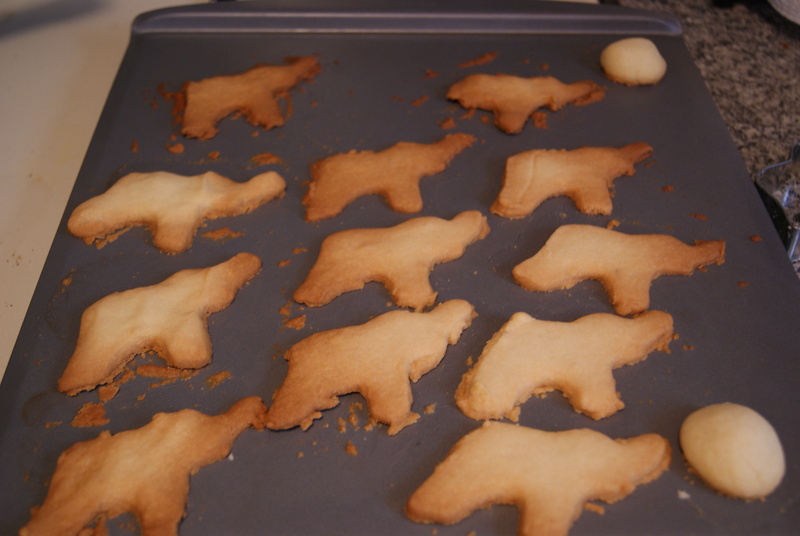 Instead of rolling mine into balls, I decided to cut them into elephants. Why elephants? Elephants are my favorite animal. I do not know why, so do not ask me. They just rule, so send along anything that has elephants on it, so that I may add it to my quirky-and-not-at-all-sad collection. Most of my friends already have (including the twins, who gave me a bamboo plant in an elephant-shaped pot as a housewarming present). Cute, right? I thought so. I even went to pet one, and the trunk broke off. So, um, refrigerate them for a really long time before you handle them. Even after they’ve cooled, you need to be very careful with them. A few of these soldiers lost legs. Poor suckers. Now, Geneva cookies have a layer of dark chocolate and are topped with chopped pecans. I melted 1/4 cup of semisweet chocolate chips with 1 teaspoon of butter at 15-second increments, then slowwwwly spread the melted mixture over each cookie with a butter knife. Then I sprinkled nuts over the cookies like a brown, frustrated fairy godmother. These don’t really still look like elephants, do they? Man, I have some serious issues frosting my animals. (Is “frosting your animal” a euphemism? I should Urban Dictionary that one to make sure.). Anyway, they taste good, but I’m not sure they measure up to the real deal. I’ll let the boys decide. Preheat the oven to 350°F. In a small bowl, sift together the flour, baking soda and sea salt. In a larger bowl, cream together the butter, sugar and oil until fully combined. The mixture will be pretty soft and gooey. Add in the egg and vanilla. When all the wet ingredients are fully mixed, add in the flour mixture. 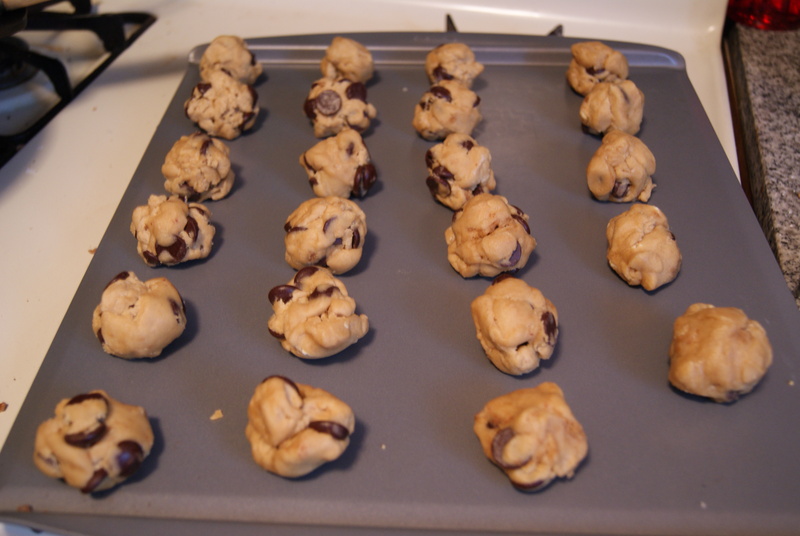 After everything’s completely combined, fold in your chocolate chips. Because I’ve been working on all these cookies over the course of a couple of days, I refrigerated this dough overnight. It’s a little easier to work with when the dough is colder, since it can be formed into balls that will stay firm and not spread or melt on you. This will lead to less frustration, and if you’ve just spent most of your night trying to keep elephant cookies intact, you will appreciate this. Before I continue, may I just say that the addition of olive oil really elevates these cookies? Seriously, I felt so classy making these. Anyway, sprinkle a touch of sea salt over each cookie, then send these into your hot oven for 10-11 minutes, until the tops are slightly browned. 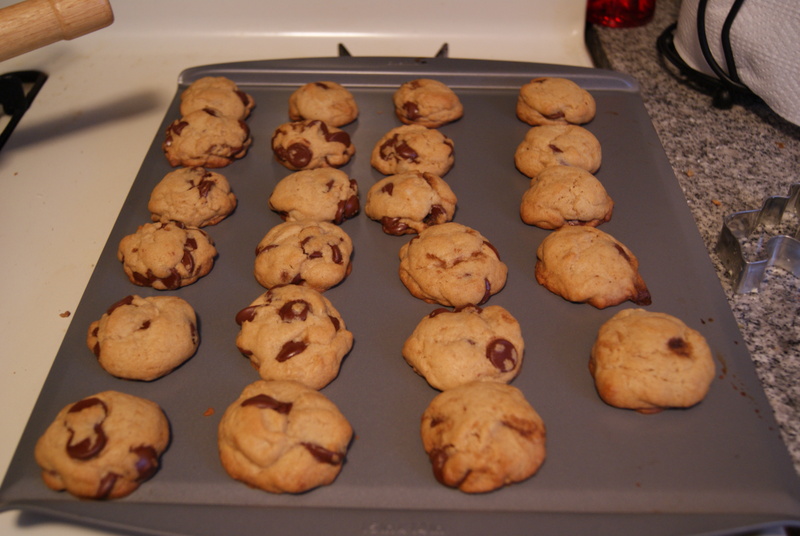 So, as you can see, there is an odd number of cookies on my cookie sheet. I can’t give one twin more cookies than the other. That would just be rude. To keep myself from having to choose, obviously I ate one. And I enjoyed it. Again, I am a good friend. I swung by my local bakery and bought two cake boxes to place the cookies in (At 50 cents total! ), to up the presentation factor a little. I hope it worked. Anyway, happy birthday friends! To another couple of awesome quarter-centuries. ← Let Me Eat Cake. Just Not Fruit Cake. I get what you mean about fragile dough. This is a trick I figured out while preparing one particularly obnoxious batch of sugar cookies shaped like santas. Take a piece of plastic wrap and tape it to a clean work surface (I just use my countertop). Plop your dough on top. Cover with a second (larger) piece of plastic wrap. From here I roll my dough out flat. The plastic wrap keeps you from a) having to add CUPS of flour to keep sticky dough from sticking and b) destroying your cookies from too much handling (you can transport them by picking up the whole piece of plastic wrap that you taped to the table and then sliding them onto a baking sheet. I think you could use wax paper for the bottom layer and avoid having to move them at all (but as I never stock wax paper, your guess is as good as mine). Kim, if ever I make cookies similar to these, I am definitely using this trick of yours. I basically did use buckets of flour trying to keep this dough dry enough to handle. Good to know for next time, if there is a next time…thanks!